Paul Smyth marked his Queens Park Rangers debut with a brilliant winning goal against Cardiff City. The 20-year-old Northern Irishman gathered Matt Smith's flick on to burst into the box and fire home. Joe Ralls gave Cardiff the lead with a penalty after Callum Paterson had been bundled over by Jake Bidwell, but Smith hit back for QPR with a header. Junior Hoilett thought he had rescued a draw for Cardiff, who were furious his effort was flagged for offside. The Bluebirds remain fourth despite now having lost four successive Championship games - the worst run for manager Neil Warnock for nine years. Rangers climb a place to 17th with their second win in 11 games and are now six points clear of the bottom three. After Ralls had put Cardiff ahead early in the second half, the hosts hit the woodwork twice before Smith hauled them level - rising to head in Jack Robinson's long throw. Smyth, a summer signing from Linfield, had an outstanding afternoon after being given his chance by Ian Holloway. He had set up chances for Smith and Massimo Luongo before scoring, skipping past Cardiff defender Bruno Ecuele Manga on the left and firing home with the help of a slight deflection off Sol Bamba. Smyth was cheered off the pitch by the home fans as he was substituted after picking up a knock soon after his goal. Cardiff would have rescued a point but for an injury-time save by keeper Alex Smithies, who prevented a Smith own goal by clawing away the striker's misplaced header, and the Bluebirds felt even harder done by when Hoilett had a goal disallowed. 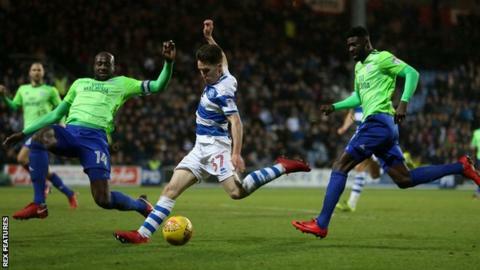 The visitors argued that a Rangers player had touched the ball before it reached the forward, but referee Tim Robinson stood by the decision following a lengthy consultation with his assistant. QPR boss Ian Holloway, on selecting Paul Smyth: "It was probably one of the biggest risks I've ever taken. "It could have gone horribly wrong, but it didn't. He was a breath of fresh air. "I thought their centre-backs might have problems with him, it was just about how he was going to handle it. "Sometimes you need that bit of freshness. We are reshaping the tree of QPR." Cardiff manager Neil Warnock told BBC Sport Wales: "The referee is in a good position... he thinks the ball was deflected and clearly it's [QPR midfielder Josh] Scowen who has played the ball - so he [Hoilett] can't be offside. "We've lost four on the trot now and three of them I don't know how we've lost them. "I thought we were so far ahead today but it's a like a Sunday League the first goal so it's our own fault for conceding. It's disappointing." Match ends, Queens Park Rangers 2, Cardiff City 1. Second Half ends, Queens Park Rangers 2, Cardiff City 1. Corner, Queens Park Rangers. Conceded by Brian Murphy. Attempt saved. Aramide Oteh (Queens Park Rangers) right footed shot from a difficult angle on the right is saved in the centre of the goal. Assisted by Josh Scowen. Attempt saved. Bruno Ecuele Manga (Cardiff City) header from the centre of the box is saved in the top left corner. Assisted by Joe Ralls. Luke Freeman (Queens Park Rangers) is shown the yellow card for a bad foul. Attempt saved. David Junior Hoilett (Cardiff City) right footed shot from outside the box is saved in the centre of the goal. Offside, Queens Park Rangers. Luke Freeman tries a through ball, but Aramide Oteh is caught offside. Delay in match Alex Baptiste (Queens Park Rangers) because of an injury. Corner, Cardiff City. Conceded by Alex Baptiste. Substitution, Queens Park Rangers. Joel Lynch replaces Jake Bidwell. Offside, Cardiff City. Kenneth Zohore tries a through ball, but David Junior Hoilett is caught offside. Attempt missed. Sol Bamba (Cardiff City) right footed shot from a difficult angle on the left is close, but misses to the right following a corner. Corner, Cardiff City. Conceded by Jake Bidwell. Substitution, Queens Park Rangers. Aramide Oteh replaces Paul Smyth because of an injury. Attempt missed. Nathaniel Mendez-Laing (Cardiff City) header from the centre of the box misses to the left. Assisted by Joe Ralls with a cross. Corner, Cardiff City. Conceded by Nedum Onuoha. Goal! Queens Park Rangers 2, Cardiff City 1. Paul Smyth (Queens Park Rangers) left footed shot from the left side of the box to the high centre of the goal. Assisted by Matt Smith with a headed pass. Attempt blocked. Matt Smith (Queens Park Rangers) left footed shot from the centre of the box is blocked. Attempt missed. Joe Bennett (Cardiff City) left footed shot from outside the box is too high from a direct free kick. Paul Smyth (Queens Park Rangers) is shown the yellow card. Substitution, Cardiff City. Nathaniel Mendez-Laing replaces Rhys Healey. Matthew Connolly (Cardiff City) wins a free kick in the defensive half. Attempt saved. Matt Smith (Queens Park Rangers) left footed shot from the centre of the box is saved in the centre of the goal. Assisted by Jordan Cousins. Attempt blocked. Jordan Cousins (Queens Park Rangers) right footed shot from the centre of the box is blocked. Assisted by Paul Smyth. Goal! Queens Park Rangers 1, Cardiff City 1. Matt Smith (Queens Park Rangers) header from the centre of the box to the top left corner. Assisted by Jack Robinson.